The world is changing fast! All over the world, railroad tracks bridge countries and continents, and journeys that would take weeks can now be completed in a matter of days. Seas are no longer obstacles: huge steamers carrying hundreds of passengers sail across the oceans. 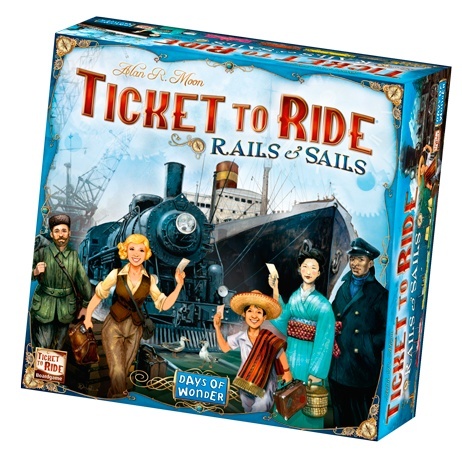 In Ticket to Ride: Rails & Sails, players collect cards of various types (trains and ships) that enable them to claim railway and sea routes on a nicely illustrated, double-sided board featuring the world map on one side and the Great Lakes of North America on the other. From Los Angeles to Sydney, Murmansk to Dar Es Salaam, Ticket to Ride: Rails & Sails takes you on a railroad adventure across the entire globe!